Start of the new season in the "Historic Locoshed"
Bitte beachten Sie, dass am 22.06.2019 aufgrund einer geschlossenen Veranstaltung kein Museumsbetrieb stattfindet. When you are planning to make a visit to the historic motive power depot at Wittenberge and would like to make a tour of our facilities, we have now put online a virtual tour of our facilities and some of the buildings for you. Have a look around!You will find the tour of the depot here. On the following pages, we show one of our current projects. This is the restoration of diesel railcar trailer VB 197 805 for display. Its original running number was VB 147 027, and after acceptance it started work from the railway depot at Seddin. Throughout the Second World War and for almost all its service life on the German State Railway (the DR), it worked from depots in Berlin and Brandenburg. Amongst other allocations, it spent several years working from Frankfurt (Oder) and Templin. 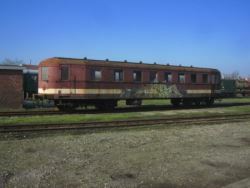 There are also photographs of it in service on the island of Usedom. After its withdrawal, it could be found stored out of service in the railway depot at Jerichow. Further information on the carriage and its restoration can be found here. The Bahnbetriebswerk (Bw), or railway motive power depot Wittenberge, looks back over more than 160 years of history. Once, Bw Wittenberge was one of the largest on the German State Railway (DR). As long ago as 1846, the Berlin-Hamburg Railway (BHE) started using the first loco-shed, today known as No. 3 shed. In 1872, there followed a roundhouse with 18 tracks and a turntable at its centre (later known as No. 1 shed). Between these two sheds, a roundhouse shed was built in 1889, the "historic engine shed" of today. Two water towers were added in 1873 and 1898, with various workshops and locomotive servicing facilities expanding the motive power depot which in 1915 reached the size we see today. In the 1960s, Wittenberge developed to become a principal depot employing around 1000 railway staff and with an allocation of some 150 locomotives. Wittenberge depot was known by railway enthusiasts from all over the world, especially for its allocations of 01.5s, 50.35s and oil-fired class 44s and 50s. It was only in spring 1987 that the last steam locos were taken out of service in this town on the banks of the Elbe. In the 1990s with the collapse of rail traffic on DR metals, Wittenberge depot rapidly declined in importance. The shed doors closed in 1997 and nature set about the task of gradually reclaiming the area. Then after 15 years slumber, a miracle happened: steam locos moved back into the half roundhouse. In autumn 2010, the town of Wittenberge had acquired the land of the former railway depot as well as the two surviving loco sheds, the turntable, the water towers and all the track. 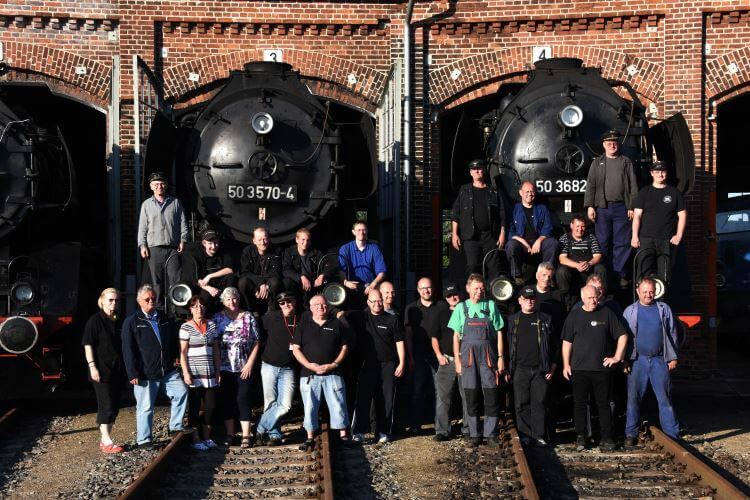 In summer 2011 extensive renovation work began with the assistance of funding from the European Union, the State of Brandenburg and of the federal government along with the reconstruction of the half roundhouse to create the largest railway museum in Brandenburg. In autumn 2012 came the day: the historic loco depot once again opened its doors. Undoubtedly, the stars of the collection are the four steam locos of class 50.35, for such a long time typical of Wittenberge depot. Apart from these, visitors can also admire the cute little industrial loco Emma and a class 44 heavy freight loco, as well as seven main-line diesels and seven smaller diesel locos The railway enthusiasts also look after a hospital carriage of the Deutsche Reichsbahn, the car-carrier which formed part of the first GDR ministerial train and a number of hand-trolleys. The signal box "Wm", built in 1909, is also part of the railway museum and anyone who wishes to try their hand on the levers can find out just how much physical effort lay behind resetting points and signals in the old days. During the winter season and outside the normal opening hours by special arrangement. Entrance at steam weekends including a cab ride is 6 euros per adult and 3 euros per child (from 3 to 12 years). A family ticket is available for 15 euros. Entrance at other times is 4 euros for adults and 2 euros for children. A family ticket costs 10 euros.